Die Mattebox Clamp-on benötigt einen Objektiv Adapterring. Sie finden die passenden Adapterringe unter dem Register Zubehör. More Than Ever, The Only Matte Box you Will Ever Need. 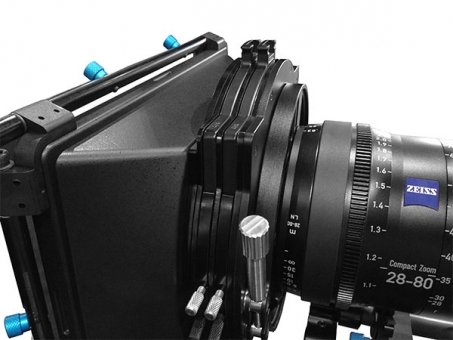 The #1 Best-Selling matte box in the cinema market to-date it has just doubled its appeal. The microMatteBox Clamp-On Bundle is a new twist on an old favorite, attaching directly to your camera’s lens and eliminating the need for rails and baseplate. Building on the success of the microMatteBox swing-away version, the Clamp-On version offers many of the same great features in a lighter-weight more compact package. And you can switch between clamp-on and swing-away versions in a matter of a few minutes. All the accessories and stages you need, and now the option for clamp-on or swing-away, the microMatteBox is truly the only matte box you will ever need. Zoom lenses are increasingly the preferred go-to lenses for productions that need to be fast, nimble, and always ready for the shot. These lenses feature a huge range of focal lengths, and enable crews to save time by eliminating lens changes. The microMatteBox Clamp-On is the perfect companion for compact and standard cinema zooms, fitting the larger cine zoom lenses while still delivering all the features cinematographers and operators want. The microMatteBox Clamp-On fits lenses up to 138mm front diameter (and by special order up to 142mm front diameter). The microMatteBox Clamp-On Bundle 2-Stage features two 4x5.65 filter stages, one fixed and one fully rotatable. The bundle also includes unique 4x4 inserts that allow you to use 4x4 filters without worrying about light leaks. With optional 5.65” square filter trays, you can support even larger filter sizes. The microMatteBox Clamp-On Bundle is also compatible with the microMatteBox optional top, bottom, and side flags, allowing you to prevent unwanted lens flares no matter the shooting conditions. By clamping on directly to the lens, the microMatteBox can work without a rail system, allowing you to shed the size and weight that comes along with it. The lightweight high-impact ABS lens shade is paired with rugged aluminum construction, delivering the ideal balance of weight and strength. Ideal for ENG environments, the secure tension-based locking mechanism allows the microMatteBox Clamp-On to attach directly to a lens using one of the various-sized Lens Adapter Rings sold separately. Quick Change to Swing-Away and Back. The microMatteBox Clamp-On Bundle shares many components with the traditional swing-away microMatteBox bundles, and can be converted at anytime to a 15mm or 19mm swing-away matte box with optional accessories. Whatever your need, the microMatteBox can meet it. How many filters can I use in the microMatteBox Clamp-On Bundle 2-Stage simultaneously? You can use up to 2 filters simultaneously in the microMatteBox Clamp-On Bundle 2-Stage. Can I rotate the filter within the matte box for use with a polarizer or FX filter? Yes, one filter stage has 360? of rotation, the second stage is fixed. 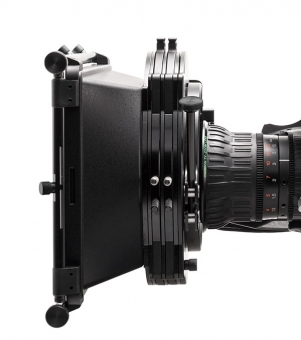 What lens diameters are supported by the Clamp-on Adapter for microMatteBox? The clamp-on matte box works by attaching to the front of your lens. We currently offer the following sizes for the lens outside diameter (not the lensí filter thread size): 85mm, 95mm, 110mm, 114mm, and 136mm. Can I attach the Clamp-On Matte Box to my Still Photography Lenses? 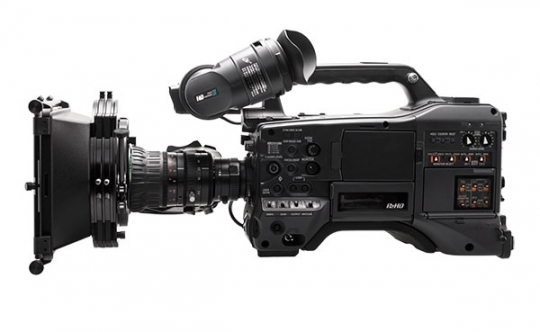 Yes, but we offer the caution that lenses must be able to support the weight of the matte box. The Clamp-on Adapter must be attached to a lens that has one of the supported front diameters. Step rings can be used to attach the Clamp-on Adapter to photography lenses, but we only suggest attaching the Clamp-on to lenses with an all-metal construction. Do I still need a rail system with this adapter? No, the Clamp-on adapter enables the microMatteBox to attach the front of the lens without any rail support or baseplate required. Can I still use my top and side-flags with the clamp-on matte box? Can I still use the new Universal Lens Donut with the clamp-on matte box?